Below you will find the technical specifications, features and benefits for the Frame Containment Tank. These spill containment and decon tanks feature a robust inner fabric liner and rigid outer walls to successfully contain both large and small quantities of liquid. In addition, frame tanks are also incredibly easy to fold and transport, making them the perfect choice for portable or multi-use applications. 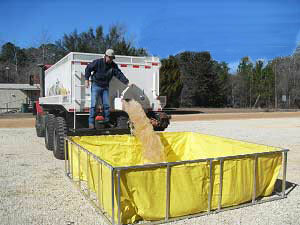 For additional information: Frame Containment Tank Product Flyer (PDF). Frame con tainment tanks are constructed using a variety of high strength material options that allow the tanks to be used in multiple containment and decontamination applications. The folding frame tank has also been used in fire fighting relief efforts in remote locations such as forests, rural areas, or other secluded spots. Since these tanks have a fast set-up time, they are ideal for efforts that require quick transportation, reliable structures, and easy-to-deploy systems. Please feel free to also check out our wide range of secondary containment products including those that can be used for the containment of tanks, military vehicles, and large machinery.